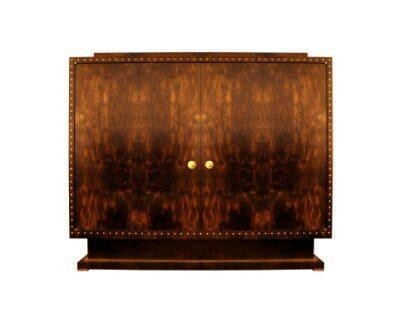 Featuring reclaimed ivory inlay dots that frame the cabinet. The craftsmanship of the skillfully pattern matched American Burl Walnut, is further enhanced with a Birdseye Sycamore interior. Reclaimed ivory knobs add a subtle finish along with Nickel trim.